Baby Costs > How Much Does Baby Food Cost? Once a baby begins to eat solids (“solids” refers to baby food and cereal, not actual table food) the cost of food can start to affect your monthly grocery bill. Usually, this takes place between four to six months old, and babies will begin eating simple rice cereal and then will progress to a mix of baby food and cereal; eventually, they will be able to eat all baby food and will no longer need formula or cereal. This transition usually takes place when they are between 12 to 15 months old. 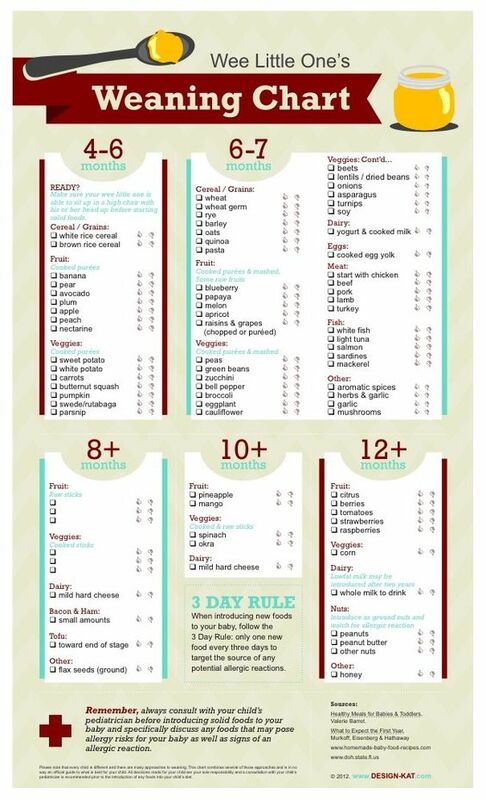 Refer to our chart below to see what your baby can eat at their age. How much is the cost of baby food? On average, baby food is going to cost the average family anywhere from $45 to as much as $115 per month when using solid foods. A box of Gerber Infant Cereal , for example, will cost about $3 for a 16-ounce box. This box can last up to a month at first, but it will gradually only last about once per week as your child grows. Gerber baby food, such as pureed bananas, apples, green beans, peas, etc., usually come in two-packs and will cost between $1-$1.50 per pack. 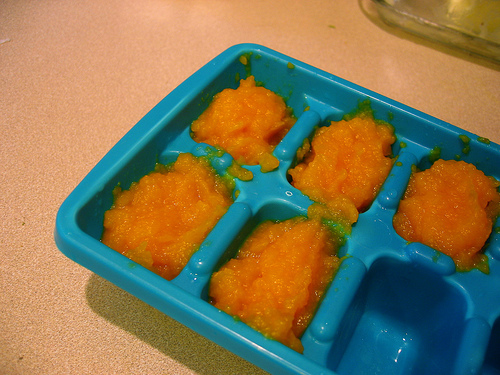 Children 6 months – 12 months will usually consume 2-4 containers of baby food per day. (An example would be a fruit for breakfast, a vegetable for lunch, and one of each at dinner.) With this in mind, you will spend between $37.50-$75 per month on baby food. Companies, such as Gerber, make many kinds of healthy snacks for babies such as fruit puffs or fruit melts. These help the baby learn how to consume solid food in their mouths without choking. Snacks like these can cost $2-$4 and will last about a week or two. For the first year, baby formula can run anywhere from $45 to $100 per month depending on the brand that is purchased. See: “How much does baby formula cost?” There are two types of formula: powder and liquid. Mint.com broke down the costs of purchasing it at the store and making the food on your own. Store-bought organic food would cost about $0.69 per serving while making it organically can cost $0.38. If you choose to buy only organic food, plan on spending between $20 and $40 extra per month. One jar of organic baby food can cost upwards of $1 to $2 per jar. Some babies need specific types of foods as a result of allergies. Soy products, for example, can be quite a bit more expensive. If you want to make your own baby food, there are baby food makers on the market that cost anywhere from $60 to $150+. Almost all stores, such as Meijer, have their baby food on sale every few weeks. It is best to stock up on baby food when it is at its cheapest. This could save you about $10 per month. Some people choose to make their own baby food by pureeing fresh fruits and vegetables. This may be less expensive, but it is also much more work. The storing and preserving of the food is the hardest part. Consider buying store brand baby food rather than the name brand. Be sure to compare the ingredients as you’ll find that many of the store brands are highly comparable. A common question online is: Can you buy baby formula with food stamps? The answer is yes. SNAP allows you to buy formula, cereals, juice and baby food. Look for baby food coupons. These coupons can be found in the local newspaper or via a simple search online.